cover art 2014 Renu Sharma. 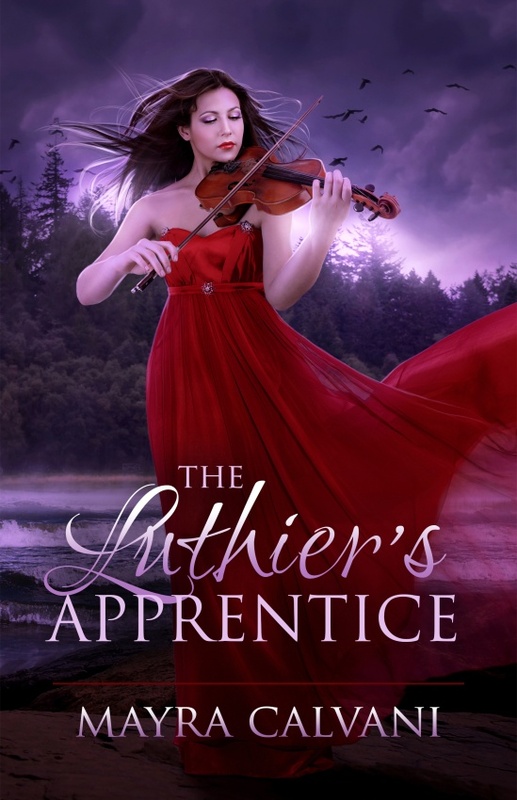 16-year old Emma must hunt her down before her own beloved violin teacher is killed. Marcel Dupriez stirred on the cot at the sound of approaching footsteps. Shuddering, he sat up. In spite of the heavy wool blanket the stunning woman had tossed at him last night, his limbs were numb from the cold. He was trapped in a small square chamber. Unlike a regular dungeon cubicle, this one was constructed from wood instead of stone. One side consisted of vertical metal bars, revealing a long passageway beyond that was dimly illuminated by flickering torches set high on the walls. His only amenities were the cot, a tiny sink, and a chamber pot. He didn’t have any idea where he was or how he had got here. His memories were distorted and his head throbbed with pain as if he had drunk heavy quantities of liquor the night before. The last thing he remembered was working in his study by the warmth of the roaring fire, then… nothing. Wait… There had been a brilliant white light—or was it an explosion? He didn’t know. Trying to remember made his temples pound even harder. Then the woman emerged from the shadows of the passage. "So, how is our special guest this morning?" Her voice, which had a strong East European accent, was cold and measured. Dupriez stared at his captor through the bars. The woman’s ash blonde hair rose high above her head, entwined with tiny sparkling amethysts. Black liner and shadow deepened her sultry, heavy-lidded gaze, turning her violet eyes into murky swamps. Her beautifully drawn lips glistened with purple lipstick. Her tall, statuesque figure was wrapped in a purple velvet cloak lined with fur. Like on her hair, amethysts glittered on her neck, ears, wrists and fingers. "Like what you see, Monsieur?" the woman drawled. Dupriez’s quiet and scientific nature, even in this situation, prevented him from succumbing to anger. He remained logical. "What is the meaning of this? Who are you?" Even as he pronounced the words, a wave of recognition flooded over him. He studied his captor’s features. Mon Dieu...c’est pas possible! The golden retriever at the woman’s side snarled. "Fair questions, Monsieur, but completely predictable. And all along I thought I was in the presence of a great mind. Bah. You are just a self-centered, pathetic creature like the rest. But first things first. Maybe your stupidity has to do with lack of food." She snapped her pale jewelled fingers. "Niccolò! The tray!" The dog growled once more, revealing a set of shiny fangs. "Calm yourself, Stradivarius. I am afraid this one is not for eating. I have big plans for him." Her foreign accent was heightened by the fact that she didn’t use contractions in her speech. Her chuckle made Dupriez’s legs almost collapse under him. "Niccolò!" she called again, glaring with impatience. "Where is that idiot?" A tall lanky man carrying a tray emerged from the darkness of the long corridor. "What took you so long? Give Monsieur Dupriez his breakfast. We would not want him to fall ill now, would we?" The servant crouched, unlocked a small opening low in the cell door with a huge iron key, and slid the food-laden tray toward Dupriez. Something about the servant—the corpse-like pallor, bony features, long thin fingers, black clothing—struck Dupriez. In fact, he looked incredibly familiar, but Dupriez couldn’t place where he had seen him before. Ignoring the tray, he whispered to the servant, "Who are you?" Offering a cold stare, the servant ignored him, locked the small door, and retreated into the shadows as quietly as a cat. "Well, as they say in your mother land, bon appetit!" the woman said. "Wait!" Dupriez called, his hands grasping the cold metal bars. "Why have you brought me to this place? Where are the others?" The woman quirked a brow. "The others?" "The other violinists. The ones you’ve kidnapped." The woman smiled at the dog. "Look, Stradivarius, Monsieur Dupriez is not as stupid as I thought." She chuckled softly. "Do not worry. You will learn everything in good time. In just a few days, on All Hallows Eve, there will be a grand party, and you—and the others—will learn your fate." "You can’t keep me here!" "How foolish of me. I should have thought of some entertainment in the meantime. I will tell Niccolò to bring you some rats to distract yourself with. They are the most intelligent creatures. Perhaps I should also bring you some tiny violins so you could teach them to play!" She turned on her heels and her fur-lined cloak swirled behind her. Her chilling laugh echoed throughout the wooden dungeon. Lying on the bed with her rabbit, Blackie, on her stomach, Emma fished inside her jeans pocket for her cell phone and speed-dialled Annika Goldsmith. She and Annika were in the same sophomore class in the English section of the European School in Woluwe St. Lambert, a suburb district of Brussels. Ever since first grade, the two had been inseparable. Annika answered on the third ring. "Hey. What’s up?" "Something bad has happened," Emma said without bothering to say hello. Emma told Annika about Monsieur Dupriez’s disappearance. "Are you serious? That’s incredibly weird," Annika said. "How can a person disappear from a locked study like that?" "Exactly. I wonder what the police think about it." "Forget the police. My father says they don’t know their butts from a hole in the ground. Why don’t we—"
"I know it sounds corny, but—"
"No, no. Actually, I was going to suggest the same," Emma said gravely. "There’s something else." Emma told Annika about her mother’s sudden travel plans. "I’m sorry about your aunt. Why don’t you stay with us?" "Thanks, but I have to stay at Grandpa’s." "Are you serious? You mean, in his house?" Annika asked. "What do you think? It’s not like I can sleep inside his workshop." "That house freaks me out. I heard weird noises coming from the attic the last time I was there. Remember?" "Probably rats," Emma said, though she didn’t believe it herself. "It didn’t sound like rats." "I’ve told you a million times: like footsteps, like low angry voices." "Come on, Annika," Emma said sceptically. Emma sighed. "I know that attic room is kinda creepy, but the rest of the house isn’t that bad. Besides, you know how I love making the violins, even though Grandpa is a pain most of the time. Anyway, I have to pack now. I’ll call you later. Then we can decide what to do about Monsieur Dupriez. Your parents get The Brussels Gazette, don’t they? Read today’s copy so you’ll know the details." "Oh yeah, right. Do that. Sometimes I forget I’m the only weird kid in the Milky Way without the Internet," Emma grumbled. Her mom didn’t allow the Internet at home, firmly believing it would be an obstruction to her school work and daily violin practice. "I’m really sorry about Monsieur Dupriez." "By the way, have you had any more psychic experiences?" "Not in the last twenty-four hours," Emma retorted. "The problem is, it doesn’t always work." "Hmm. Maybe we don’t know what triggers it. I think that’s so cool, though. Does your mom know?" "Not yet. She looked so worried about Aunt Lili… I’ll tell her when she gets back." "You’re still coming to Milda’s Halloween party on Sunday night though, right?" "Sure. I don’t think Grandpa will mind. Monday’s a holiday, anyway." They said goodbye and Emma tossed the phone on her bed. She scratched Blackie behind the ears and kissed him between the eyes. Rising from the bed, she reached for her violin case on her desk, opened it, and took out her violin, a fine instrument with beautiful tiger stripes and a sweet, rich tone that Grandpa had made especially for her. Then, with her eyes closed, she began playing one of her teacher’s favorite pieces, the first concerto he had ever taught her when she was six: Rieding’s Concerto in B minor. He always referred to it as "a little jewel." As her bow caressed the strings, and her fingers worked to achieve a rich vibrato, tears welled up in her eyes. No matter. She played until the end, savoring each note, each crescendo. When she finished, she held the violin close to her heart. Please, God, let Monsieur Dupriez be all right. After placing the violin back in the case’s red velvet interior, Emma hauled her empty suitcase onto the bed and started packing. Blackie hopped onto the pillow and watched her, his nose and whiskers twitching. Emma mentally prepared the questions she would ask Madame Dupriez. She didn’t understand why her mom considered her a nice lady. Personally, Emma had always thought of her as an old Persian cat: soft and silky on the outside, yet inwardly devious, with sharp claws ready to strike at any moment. The Luthier's Apprentice Copyright © 2014. Mayra Calvani. All rights reserved. Please do not copy without permission. Cover art 2014 Renu Sharma. All rights reserved. This page last updated 01-03-14.